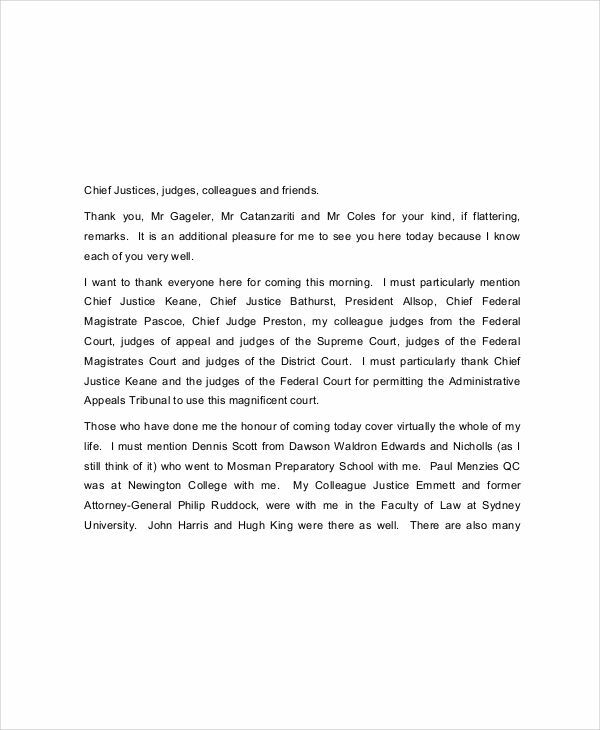 It is an undeniable truth that each and everyone of us will have our time to part ways. A concrete example of this situation is a retirement. 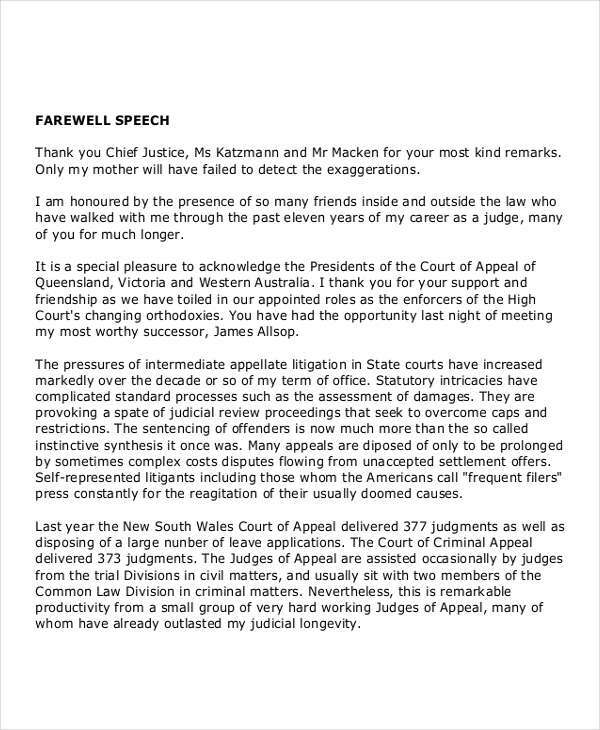 And when you retire, a speech could be inevitable. Just like a keynote speech, your retirement speech should contain revelations of some of the most important moments of your life. 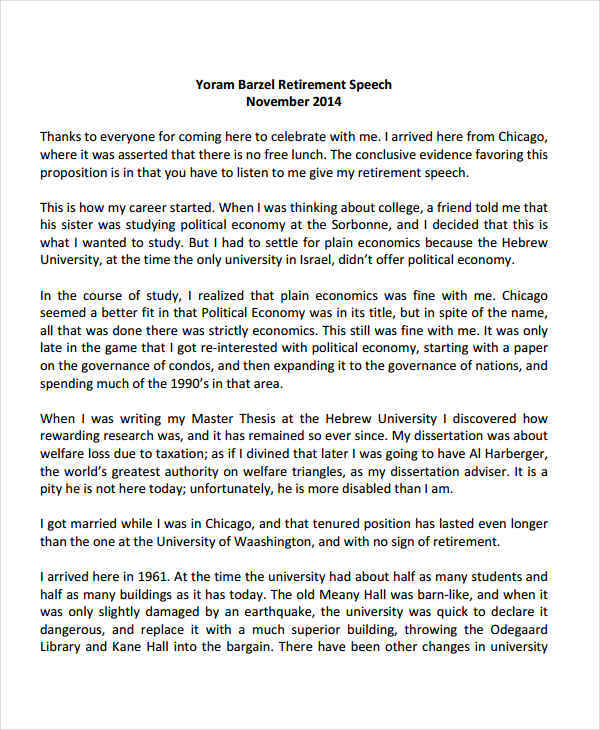 If you are confident with the way you write, you can personally draft your own retirement speech. If not, a speech writer can do the work for you. 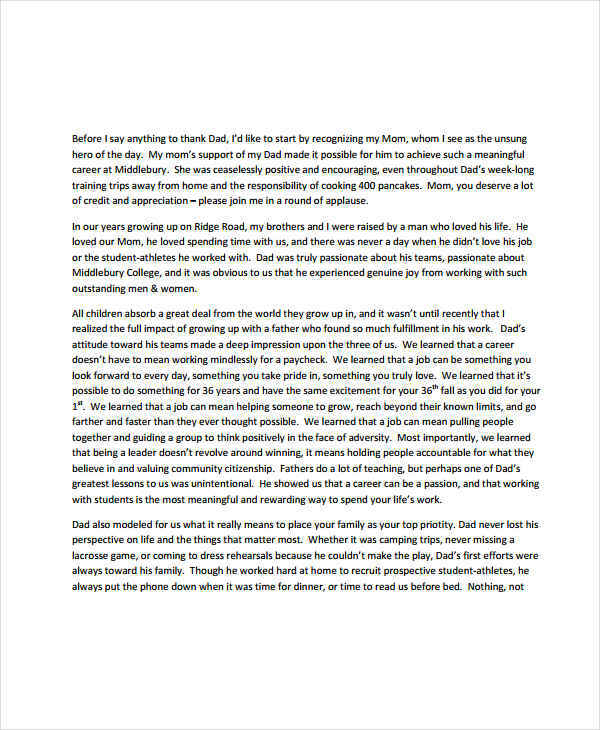 However, we have compiled some samples of introduction speech for you to have a better understanding on how to write one. There are certain rules to follow when writing a speech. Though most speeches require the basic structures like the introduction, the body, and the conclusion speech, a personal touch is probably the most important part. The speech has to reflect a person’s character in the way that the words are arranged and the language used to convey the meaning. In addition to that, a retirement speech should at least narrate a short story of an unforgettable moment that may have changed the your life. Lastly, since it is a farewell address, it should have words of gratitude to the people who have been a part of the journey. On retirement, you have so much experience to share and stories to tell. 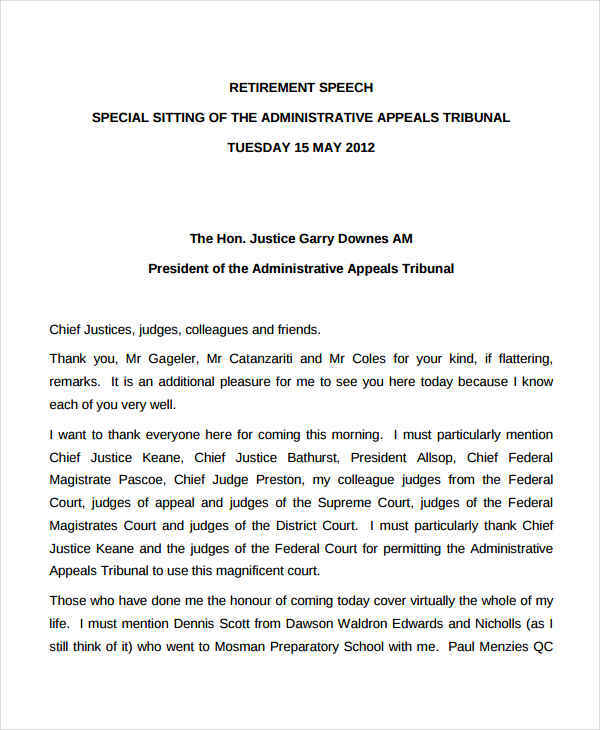 A retirement speech in pdf is also considered by some as an opportunity to thank their colleagues and everyone who has contributed to their growth as a person and as an employee. 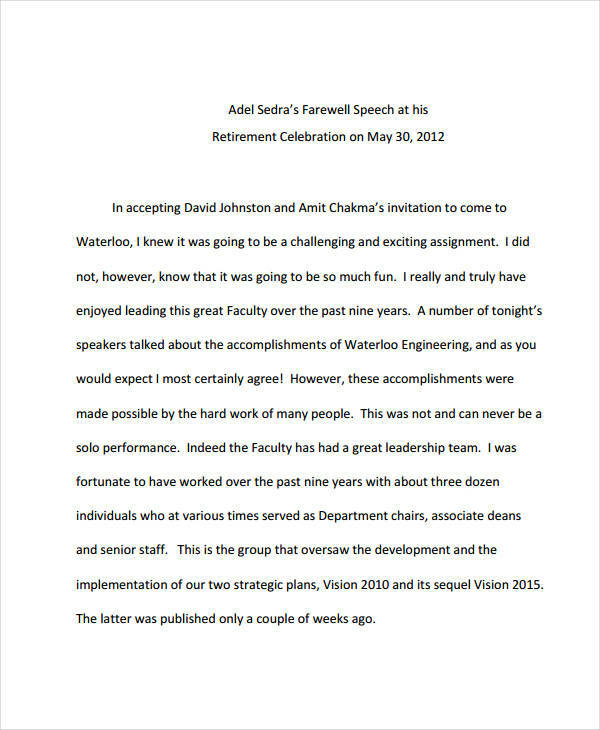 Some even use retirement speech template to impart lessons in life, lessons they have learned for all those years of hard work and dedication. Others wold even say jokes as a way of telling people that it has been a wonderful journey and that their retirement is just another step towards a new beginning. 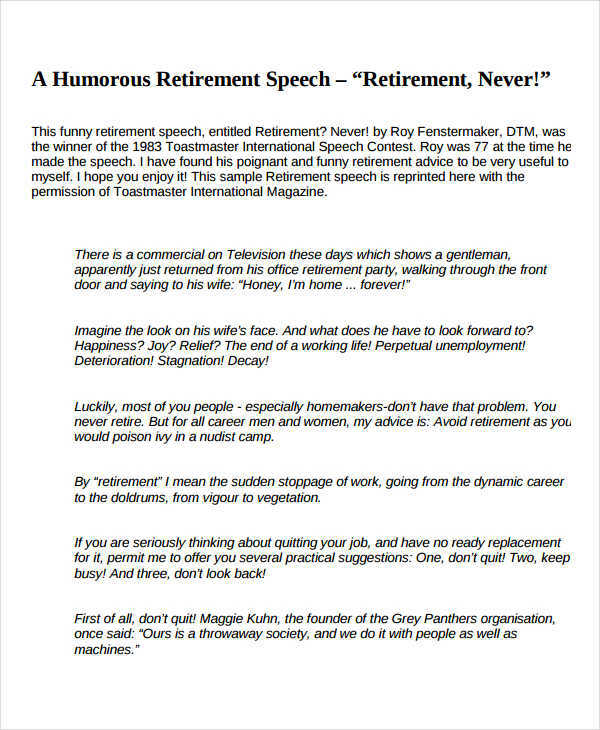 Why Do You Need a Retirement Speech? Writing a speech takes a lot of time and effort specially if you are not used to doing it. However, it is never a standard to write a grandiose speech outline. The most important thing is you get to say what you want to say. Most employees who end their professional careers after a considerable period of time prefer to have their retirement speeches. Not that they want to be recognized by everybody but to say their words of appreciation and indebtedness to the company. Your retirement speech doesn’t have to be too educational or informative speech. Here are a few tips in preparing your retirement speech. Do a recollection. Reflect on your past memories and remember those instances where you faced challenges, how you overcame them, and who were the people who helped you get through it. Be confident. Smile. 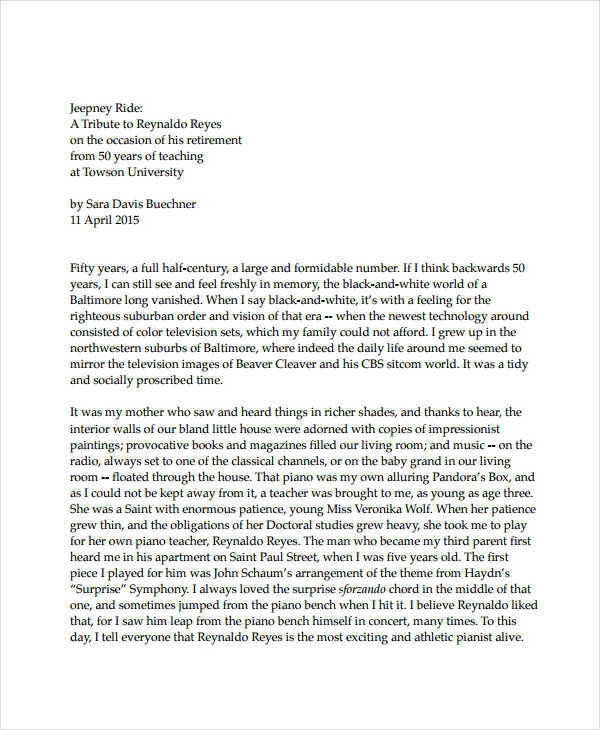 Think of writing a retirement speech template as a walk in the park. Don’t put too much pressure on yourself. Create a style. Don’t jumble your sentences. Before you start writing your retirement speech, design a layout on how your thoughts should flow.